I'm always looking for new products when it comes to my hair. So when given the chance to review the newest collection, Mind Blowing, from got2B, I was pretty excited. The one thing that caught my eye was the great bottle colors and the fantastic smells of the products. The Mind Blowing Collection includes the Mind Blowing Quick Shape Mousse, Mind-Blowing Xpress Dry Styling Spray and the Mind-Blowing Fast Dry Hairspray. The Mind Blowing collection is made to leave your hair soft, shiny and frizz free by using their three step process. Step 1 - Reduce your blow drying time and increase your style ability with IONIC+ System technology.The Mind Blowing Quick Shape Mousse adds volume and increases shine, leaving your hair soft. Apply it to the roots of damp hair before blow drying, and watch your hair quickly shape into a glamourously voluminous style. Step 2 - The Mind-Blowing Xpress Dry Styling Spray works with damp hair to expedite the drying process while protecting the hair from heat, and keeping hair from tangling while blow drying. Your hair is left shiny, sleek and smooth to the touch. Apply to towel dried hair and blow dry using a round brush for the ultimate blow out. Step 3 - Last, the Mind-Blowing Fast Dry Hairspray is the finishing touch. IONIC+ Power and Micro-Diffuser Technology offers fast drying time and flexible hold so you can run your fingers through your hair to achieve the perfect blowout. Hold it 8-10 inches from your hair and spot spray and use hands to create extra volume and then spray evenly for an all over hold. The Quick Shape Mousse was the first product I tried. I don’t like to use mousse because once it dries my curly hair starts to go frizzy and unmanageable. I am so glad I got to try this product! I absolutely love the smell. It is neutral for sure, not feminine but not masculine either. Left my hair really soft and so shiny! I had tons of volume and my layers looked great, really defined. Lasts all day and super easy to style the next morning. It did leave my hair a bit tangled. I would recommend either washing your hair the next day or adding more of the mousse for your hairstyle the next day. The bottle is quite big and a little bit goes along way. I could say I'm a fan of mousse now, but really I'm just a fan of the Quick Shape Mousse. This is definitely something I will be buying in the near future. The Styling Spray wasn't what I thought it would be and I was a bit disappointed with it. I was thinking it would leave my hair feeling shiny and smooth but it didn’t. I used it after my hair was blow dried and before I used my flat iron. I think that was the problem, I was suppose to use it before I blow dried my hair. It left my hair sticky and the hold was too strong. The feeling of my hair was rough and very hard to comb or run my fingers through my hair. When I do use it again, I will make sure to use it before I blow dry my hair while it's damp to see if the outcome changes. Lastly, the Fast Drying Hair Spray, my favorite out of the three from the Mind Blowing Collection. I have tested a lot of hairsprays and this by far is my favorite. I hate hairsprays that are wet and sticky and this is brush able, soft, and holds all day! My hair stays in place and after leaving in my hair for hours it doesn’t become flaky on my scalp or leave it itchy. Over all the products and brand are great. The smell is amazing and leaves it feeling full and stylish. I would recommend the Mind Blowing Collection to friends and family. 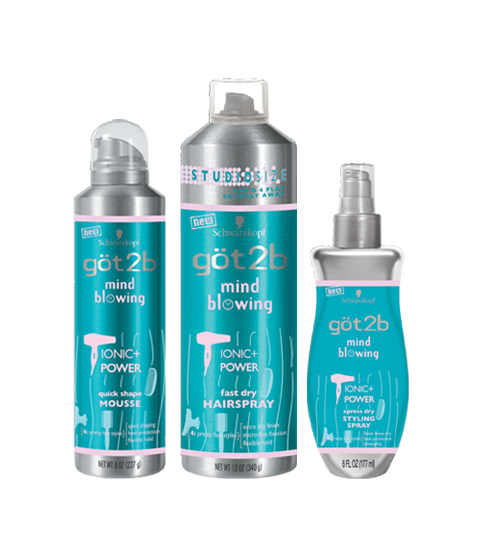 got2b Mind-Blowing products are now available retailing at $7.99 for the Dry Styling Spray and Mousse and $9.99 for the Hairspray at retailers nationwide, including: Shoppers Drug Mart, Walmart, Loblaws, PharmaPlus, Rexall and London Drugs. For more information about the Mind Blowing Collection be sure to check out got2B online. Disclosure: All opinions are my own. I received got2B Mind Blowing Collection at no cost for the purpose of this review. No other compensation was received.